Lilac, Pink, Mint Green, White. New ListingANTIQUE GOLD TONE TINY MESH COIN CHAIN PURSE SMALL 3"
Vintage SAKS FIFTH AVE Leather Calfskin Purse Shoulder Bag MADE IN ITALY. Shipped with USPS Priority Mail. Top grain Calfskin with vinyl lining. Inside has 1 zippered pocket. Measures 10.5" high, 9.5" depth and 10" wide. Inside is spotless, outside has a few scuffs, nothing bad, looks like been stored away. Pink (silk? )evening bag with crystal and gold colored beading. Silver tone closure and chain handle. The fabric is wearing from age and somewhat discolored. I have not tried to clean it. Beading and crystals are all intact. Pictures show the fabric wear and discoloration. Still a very pretty and unique piece. Measures 6” across, 5” high. 12 inch chain. 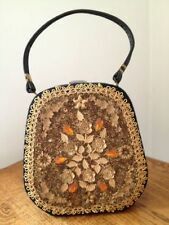 New ListingStunning & Rare, Vintage Whiting & Davis Co., Mesh Hand Bag Purse NR! NO RESERVE! A NOTE ABOUT GOLD CONTENT: We are long established professional jewelers. We will specify if an item is not solid gold. Perfect for carrying just the essentials. ▪️Style:Crossbody. ORIGINAL by CAPRICE. MULT-COLORED SNAKESKIN SEWN PATCH WORK FRONT WITH A BLACK. SUEDE LEATHER BACK. A GOLD TONE CHAIN THAT CAN BE TUCKED INSIDE FOR A CLUTCH. FLAP FRONT WITH A FLIP-OVER CLASP. BLACK LEATHER LINED WITH AN INSIDE ZIPPERED POCKET. A couple small marks--see pictures! width: 10 in. 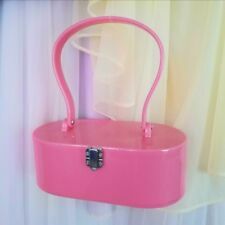 Welcome to my listing where I offer this lovely vintage handbag. It measures approximately 9" x 3" x 7" with a 6" strap drop. It has a gold-tone metal frame. The inside is fabric lined & has a zipper pocket & open pocket. The lining has some age staining like foxing on old paper. It is by "Corde' Bead". I can't read where it was made. There also is a maker's mark on the frame that I cannot read. It is so pretty & in very good vintage condition. It will make a nice addition to your vintage handbag collection. There is actually black glitter covering the entire bag which is really cute. It has a beaded strap with black glass bugle beads. Perfect for any formal affair or the Red Carpet! Vintage Norell Black Sequin Satin Clutch Evening Bag Purse Rhinestone Clasp with original box. Measures 8” x 5” and is in excellent condition with no visible signs of use. Comes with the original box which has some wear from storage. Thanks for looking! THE TOP OF THE CASE IS DECORATED IN A SMART LOOKING SWIRL DESIGN. UNIQUE IN EVERY ASPECT INCLUDING THE TRI-COLOR MARBLE! IT IS ABOUT 3-3/4" X 3-1/4" X 1". ATTACHED STRAP IS ABOUT 4-5/8" IN LENGTH. GOOD LUCK! This purse dates to around the 1920s era, and is a sway/pouch design. The corded drawstring is threaded through black ½” Bakelite(?). Very sweet and unusual piece. It also appears that the cording was once covered in a thin layer of black silk. Adorable Black Velvet clutch purse. Back hand Strap, beading and jewels on the front. Lined inside. Perfect for the elegant evenings out or to dress up any casual outfit. Overall good condition but can be resewn in a few areas or pinned See photos at top zipper. pretty zipper. Nice 40's hand bag. UP FOR SALE IS THIS NICE LITTLE PURSE. THE FRONT CENTER IS A TAPESTRY. THE REST OF IT IS A HARDER TYPE MATERIAL THAT I AM CALLING CANVAS. NOT 100% SURE OF THE MATERIAL. THIS IS A DEEP WHAT I CALL AN ARMY GREEN/GREY WITH A DARK MAUVE STITCHING. A PRETTY VINTAGE VELVET PURSE c.1960's. In very good clean condition. Inside lined in black taffeta material with coin purse. Latch is clear plastic and has 2 straps. Measures 7 1/2" x 5" . Will ship in 2 days of receiving payment. Paypal. I will except returns if not as described. Please leave me feedback that way I know you received the purse and are happy with it. The beads are beautiful all in place as indicated in the picture there's a small stain and a little black mark on the inside of the bag. The bag was made in Japan. 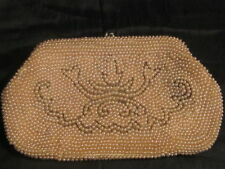 Unique and gorgeous vintage beaded purse. Rusty orange color silk fabric with black and pink beads. Please see second photo as there is some beads missing, would be an easy fix for someone who knows how. 7x9in. Small zippered pocket inside, magnetic closure. Great special occasion bag, has a beautiful vintage boho vibe to it. Fits a phone and small wallet nicely! COBLENTZ Vintage Black PermaSuede Gold Hardware Handbag With Clasp Plus 3 Coin Purses . The hand bag is in good condition for its age. This handbag measures 8" long and 6" high. The handbag has some wear on the suede on the top flap and some discoloration on the gold hardware. The front and back, sides, bottom and strap are in good condition. The inside is also in very good condition with a working zipper on the pocket. Please look at the pictures to judge the condition for yourself. 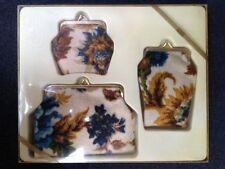 Also included are three vintage change purses which are also in good used condition. The colors are black, brown and olive green with gold hardware. Shipped with USPS Priority Mail. Soft taupe background. The flowers explode in burgundy, greens, pinks, and blues. The opposite side also has yellow blossoms. Inside is lined in a taupe silk and accented with flower appliques. Chain has two purple crystals. Antique Netted & Beaded Miser's Purse. This antique miser's purse has been hand netted using very fine dark blue silk. Tiny faceted gold beads and been worked into the netting in diamond patterns. The netting is super fine, only 1/8" between the knots. Clean Wyly's embroidered leather bag. Old and in very good shape. New ListingVintage Art Deco Metal Purse, Great shape! No idea of manufacturer or age. No condition issues. In 1975 in Norwalk, CT, Dooney & Bourke was born through the creative vision of Peter Dooney and the entrepreneurial spirit of Frederic Bourke. Dooney & Bourke. About Dooney & Bourke All Weather Pebbled green awl Leather Wallet. There is a monogram on the front right corner. Antique Beaded Purse With Red Blue And Green Floral Motif Draw String. Crochet at top. Beautiful detail and craftsmanship. Blue silk lines. Beads missing at bottom as seen in pictures. Gorgeous piece! Shipped with USPS Priority Mail. Genuine Tooled Leather. Tooled Floral Design. Signs of wear; mild scuffs, marks, and discoloration present. This bag is clean. 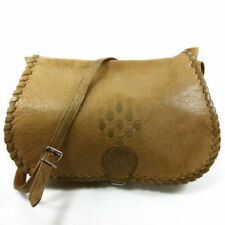 Since at least the 14th century, men and women have carried pouches filled with essential items. While they were often tied to the leg inside outer garments, by the start of the 19th century, many people carried handbags, bags, and cases with them regularly. Starting with the turn of the 20th century, each decade has seen its own style. What are some types of vintage bags, handbags, and cases? Dorothy: These options gather at the top, and they were often made to match a woman's robe. Pochette: This is a handle-less clutch often decorated with geometric shapes. Doll: These choices were often designed to look like the person carrying them. Envelope: These choices were built on a metal frame and are usually about 12 inches tall. Scalloped: These options have a scalloped design at the bottom before rising to a smaller top, and they have no handles. Wrist: Usually made of leather, these choices have a wide strap that fits snugly around the wrist. Rucksacks: This type is a strong bag designed to be worn on the back. What are some vintage handbag styles? 1900s: Satin purses decorated with glass beads were carried by many women. These usually closed at the top with a metal clasp, and they were carried from the shoulder on a chain. 1910s: Women who had to go to work often wore briefcases made from leather that hung from their shoulders. Dorothy bags large enough to carry opera glasses and a fan were often the evening bag of choice. 1920s: Small leather or metal mesh wristlets or clutches decorated with iridescent beads were often chosen. Others, however, selected shoulder bags made of velvet. After the discovery of King Tut's tomb in 1923, many purses were decorated with Egyptian themes. 1930s: A number of different styles were carried by women in this decade, including shoulder bags, box-style purses, pochettes, and clutches. Leather was often seen as a status symbol, while silk and satin were often used by the middle class. Many of these bags, handbags, and cases closed with zippers. 1940s: Like the 1930s, purses did not bear much adornment during this decade due to World War II. Many had a square appearance. A purse carried by a forearm strap was sold in many stores. 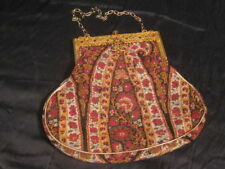 Many women chose synthetic fabric purses such as rayon while others carried purses made of wood or plastic. 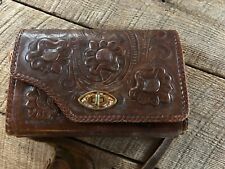 1950s: Most purses made during the 1950s were either clutches or box styles, and they were made of leather or straw with needlework, pearls, and beads. Smaller handbags were often seen as they accentuated a woman's femininity. 1960s: Messenger bags, shoulder bags, and purses with forearm straps were all regularly chosen by women. While many were made of leather or wool, Indian ethnic fabrics were also often seen in designer handbags. Slung shoulder bags with many zippers were often chosen by younger people.